Despite increased investment in mass transport, last-mile connectivity and access to transport hubs remain obstacles for cities across India. Photo by Jack Zalium/Flickr. Growing numbers of privately owned automobiles, pollution, and congestion have helped governments in cities across India realize the need for better mass transport systems. Cities like Delhi are now making substantial investments to improve existing systems and implement new measures. However, even as Delhi is investing in rail and bus lines, “last mile connectivity” – connecting people from their homes to transport hubs – remains an area of concern and neglect for the city and the country as a whole. This lack of affordable and safe last-mile connectivity has created a situation in which the poorest, who rely most on mass transport, are the very people that are having the hardest time reaching safe, sustainable, affordable transport options. In November 2013, the Rapid Metro, India’s first entirely privately funded mass transport venture, began operations in Gurgaon. It attempted to address the issue of last-mile connectivity by connecting commuters from the nearby Delhi Metro to six key places within Gurgaon, including the commercial hub “Cyber City”. However, this being a private venture, it does not meet the needs of all residents. Much of the population who travel daily to Gurgaon from Delhi or nearby regions cannot easily reach the metro because the company only developed infrastructure for those who could afford to use the Cyber City line. Many of Delhi’s residents opt to use auto-rickshaws for their last-mile commute. However, in some cases the auto-rickshaws are so expensive that they cost more than 50% of the total commute cost. 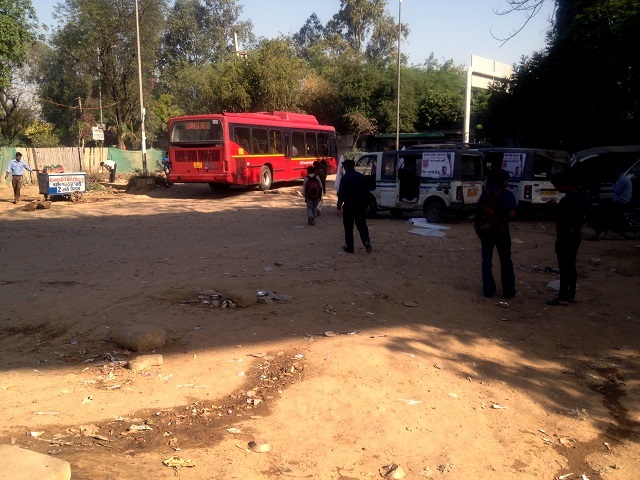 Cheaper options such as the Metro Feeder buses are extremely crowded, in dilapidated condition, and are often unreliable. As a result, those who cannot afford auto-rickshaws have to walk to get from home to work and back. Walking in India’s exploding cities is difficult, for although most metro rides in India are themselves relatively safe, this changes when users step out of the metro stations. It is almost impossible to walk to and from the metro with no sidewalks, street lights, or pedestrian crossings in the areas surrounding mass transport. Yet, as the World Bank reported, “The urban poor make up a city’s ‘captive walkers,’ but since this group has the least resources, it usually has the smallest political voice.” It is critical in creating a safe and equitable city that all people are able to access high quality, affordable transport. Those who often most need mass transport are often those who have the hardest time accessing these transport options. Photo by Brinda Sengupta. City leaders in Delhi and Gurgaon have finally realized the importance of efficient and sustainable transport. Now, city governments need to invest in feeder services and ensure accessible pedestrian environments to make the complete commuter experience safe and equitable for all citizens. A recent survey by New Delhi University’s Department of Urban Planning shows that there is a long way to go, with 65% of current metro users mentioning problems reaching transport, and 40% of private mode users pointing towards last-mile connectivity issues as a large reason for their decision to not use public transport. Yet, at the same time more than 50% of private mode users said that they would be willing to use public transport if given appropriate services to connect to transport lines. It is up to city governments to offer people that chance. Collaboration is needed between transit operators, public organisations, municipal authorities, civil society groups, and the public at large. Ideas and initiatives such as such as Corporate bus pooling, creating a Non-Motorized Public Transport Feeder Network, Autorickshaws on call are steps in the right direction. 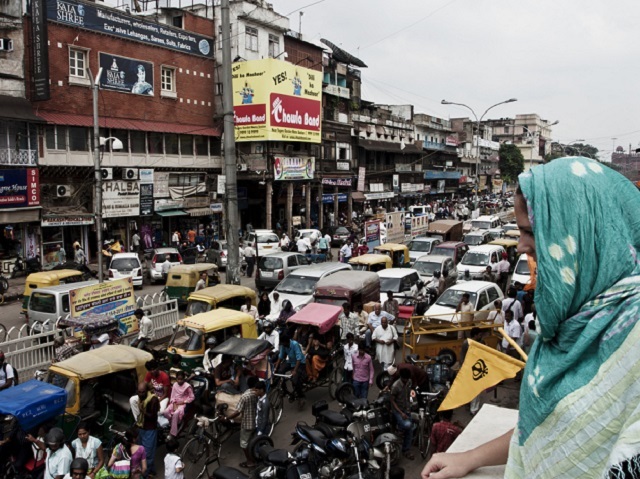 In a city where car ownership is increasing and incomes are rising unequally, finding ways to connect people to affordable transport might be India’s best chance at an equitable future.